The name of this component is "Rendering". This name shall be used when referring to this component in the COMPONENT statement (see 7.2.5.4 Component statement). This clause describes the Rendering component of this part of ISO/IEC 19775. This includes fundamental rendering primitives such as TriangleSet and PointSet nodes, and geometric properties nodes that define how coordinate indices, colors, normals and texture coordinates are specified. Table 11.1 provides links to the major topics in this clause. Most complex geometries, such as those found in the 13 Geometry3D component and 14 Geometry2D component, can be implemented as a combination of these nodes. The Rendering component provides these nodes as basic services for building arbitrary geometry types. All of the rendering primitive nodes are descendants of the X3DGeometryNode type. Several geometry nodes contain Coordinate, Color or ColorRGBA, Normal, and TextureCoordinate as geometric property node types. The geometric property node types are defined as individual node types so that instancing and sharing is possible between different geometry nodes. The TextureCoordinate node type is defined in 18 Texturing component. Color in X3D is specified using the RGB color model in which the three components of color specifications are red, green, and blue ranging in value from 0 to 1. This color model results in a color specification of (0,0,0) representing black and (1,1,1) representing white. Color may also be specified using the RGBA color model in which a fourth alpha component specifies a value ranging from 0 (fully transparent) to 1 (fully opaque). See [FOLEY] for more information on the RGB color model. Coordinates in X3D are specified as an (x, y, z) triplet in a right-handed, rectangular coordinate system. Normals define perpendicular directions from a piece of geometry and are used to perform lighting calculations. They may either be specified as part of the content or computed directly from the geometry by the browser. When specified as part of the content, each normal vector shall have unit length. Certain geometry nodes have several fields that provide information about the rendering of the geometry. These fields specify the vertex ordering, if the shape is solid, if the shape contains convex faces, and at what angle a crease appears between faces, and are named ccw, solid, convex and creaseAngle, respectively. The ccw field defines the ordering of the vertex coordinates of the geometry with respect to user-given or automatically generated normal vectors used in the lighting model equations. If ccw is TRUE, the normals shall follow the right hand rule; the orientation of each normal with respect to the vertices (taken in order) shall be such that the vertices appear to be oriented in a counterclockwise order when the vertices are viewed (in the local coordinate system of the Shape) from the opposite direction as the normal. If ccw is FALSE, the normals shall be oriented in the opposite direction. If normals are not generated but are supplied using a Normal node, and the orientation of the normals does not match the setting of the ccw field, results are undefined. The solid field determines whether one or both sides of each polygon shall be displayed. If solid is FALSE, each polygon shall be visible regardless of the viewing direction (i.e., no backface culling shall be done, and two sided lighting shall be performed to illuminate both sides of lit surfaces). If solid is TRUE, the visibility of each polygon shall be determined as follows: Let V be the position of the viewer in the local coordinate system of the geometry. Let N be the geometric normal vector of the polygon, and let P be any point (besides the local origin) in the plane defined by the polygon's vertices. Then if (V dot N) - (N dot P) is greater than zero, the polygon shall be visible; if it is less than or equal to zero, the polygon shall be invisible (back face culled). The convex field indicates whether all polygons in the shape are convex (TRUE). A polygon is convex if it is planar, does not intersect itself, and all of the interior angles at its vertices are less than 180 degrees. Non planar and self intersecting polygons may produce undefined results even if the convex field is FALSE. The creaseAngle field affects how default normals are generated. If the angle between the geometric normals of two adjacent faces is less than the crease angle, normals shall be calculated so that the faces are shaded smoothly across the edge; otherwise, normals shall be calculated so that a lighting discontinuity across the edge is produced. For example, a crease angle of 0.5 radians means that an edge between two adjacent polygonal faces will be smooth shaded if the geometric normals of the two faces form an angle that is less than 0.5 radians. Otherwise, the faces will appear faceted. Crease angles shall be greater than or equal to 0.0. The 3D graphics rendering pipeline uses an implicit step of trimming objects that are partially in the view frustum called clipping. In addition to these implied bounds, it is also possible to provide an additional clipping of the geometry through the provision of additional clip plane definitions. A clip plane is defined as a plane that generates two half-spaces. The effected geometry in the half-space that is defined as being outside the plane is removed from the rendered image as a result of a clipping operation. Clip planes may be defined at any level of the transformation hierarchy. The clip plane definitions are accumulated from the root of the scene graph down to the individual leaf nodes that are rendered. Clipping occurs against the intersection of the half-spaces resulting from the current list of transformed clip plane definitions. Since the clip planes are collected during the traversal of the scene graph, specifying both local and globally scoped planes is possible. Figure 11.1 illustrates two objects effected by a single global, horizontal plane and locally effected by a vertical plane (left) and a 45 degree plane (right). A ClipPlane node affects only objects that are in the same transformation hierarchy as the node. Each plane is transformed according to the parent transformation hierarchy but is not further transformed by the children it affects. Clip planes shall affect nodes derived from X3DBackgroundNode. Many renderers only support a limited number of clip plane definitions (typically, six). If, while traversing from the root of the scene to a particular leaf, more than the number of supported clip planes are specified, the clip plane definitions closest to the leaf are discarded first (i. e., the clip planes that are closer to the root of the scene graph are considered most important). This is the base node type for color specifications in X3D. This is the base node type for all composed 3D geometry in X3D. If colorPerVertex is FALSE, colours are applied to each face. If colorPerVertex is true, colours are applied to each vertex. If the color field is NULL, the geometry shall be rendered normally using the Material and texture defined in the Appearance node (see 12.2.2 Appearance node for details). If normalPerVertex is FALSE, colours are applied to each face. If normalPerVertex is true, colours are applied to each vertex. If the normal field is not NULL, it shall contain a Normal node whose normals are applied to the vertices or faces of the X3DComposedGeometryNode in a manner exactly equivalent to that described above for applying colours to vertices/faces (where normalPerVertex corresponds to colorPerVertex and normalIndex corresponds to colorIndex). If the normal field is NULL, the browser shall automatically generate normals in accordance with the node's definition. If the node does not define a behaviour, the default is to generate an averaged normal for all faces that share that vertex. If the texCoord field is not NULL, it shall contain a TextureCoordinate node. If the attrib field is not empty it shall contain a list of per-vertex attribute information for programmable shaders as specified in 32.2.2.4 Per-vertex attributes. If the fogCoord field is not empty, it shall contain a list of per-vertex depth values for calculating fog depth as specified in 24.2.2.5 Fog colour calculation. This is the base node type for all coordinate node types in X3D. All coordinates are specified in nodes derived from this abstract node type. This is the base node type for all geometry in X3D. This is the base node type for all normal node types in X3D. All normals are specified in nodes derived from this abstract node type. The ClipPlane node specifies a single plane equation that will be used to clip the geometry. The plane field specifies a four-component plane equation that describes the inside and outside half space. The first three components are a normalized vector describing the direction of the plane's normal direction. This node defines a set of RGB colours to be used in the fields of another node. Color nodes are only used to specify multiple colours for a single geometric shape, such as colours for the faces or vertices of an IndexedFaceSet. A Material node is used to specify the overall material parameters of lit geometry. If both a Material node and a Color node are specified for a geometric shape, the colours shall replace the diffuse component of the material. RGB or RGBA textures take precedence over colours; specifying both an RGB or RGBA texture and a Color node for geometric shape will result in the Color node being ignored. Details on lighting equations can be found in 17.2.2 Lighting model. This node defines a set of RGBA colours to be used in the fields of another node. RGBA color nodes are only used to specify multiple colours with alpha for a single geometric shape, such as colours for the faces or vertices of an IndexedFaceSet. A Material node is used to specify the overall material parameters of lit geometry. If both a Material node and a ColorRGBA node are specified for a geometric shape, the colours shall replace the diffuse and transparency components of the material. RGB or RGBA textures take precedence over colours; specifying both an RGB or RGBA texture and a ColorRGBA node for geometric shape will result in the ColorRGBA node being ignored. Details on lighting equations can be found in 17.2.2 Lighting model. The IndexedLineSet node represents a 3D geometry formed by constructing polylines from 3D vertices specified in the coord field. IndexedLineSet uses the indices in its coordIndex field to specify the polylines by connecting vertices from the coord field. An index of "-1" indicates that the current polyline has ended and the next one begins. The last polyline may be (but does not have to be) followed by a "-1". IndexedLineSet is specified in the local coordinate system and is affected by the transformations of its ancestors. The coord field specifies the 3D vertices of the line set and contains a Coordinate node. Lines are not lit, are not texture-mapped, and do not participate in collision detection. The width and style of lines are determined by the line properties specified in an associated Appearance node. If no line properties are specified, the default values for fields of the LineProperties node shall be used (see 12.4.3 LineProperties). If the colorIndex field is not empty, one colour is used for each polyline of the IndexedLineSet. There shall be at least as many indices in the colorIndex field as there are polylines in the IndexedLineSet. If the greatest index in the colorIndex field is N, there shall be N+1 colours in the Color node. The colorIndex field shall not contain any negative entries. If the colorIndex field is empty, the colours from the Color node are applied to each polyline of the IndexedLineSet in order. There shall be at least as many colours in the X3DColorNode node as there are polylines. If the colorIndex field is not empty, colours are applied to each vertex of the IndexedLineSet in exactly the same manner that the coordIndex field is used to supply coordinates for each vertex from the Coordinate node. The colorIndex field shall contain at least as many indices as the coordIndex field and shall contain end-of-polyline markers (−1) in exactly the same places as the coordIndex field. If the greatest index in the colorIndex field is N, there shall be N+1 colours in the Color node. If the colorIndex field is empty, the coordIndex field is used to choose colours from the Color node. If the greatest index in the coordIndex field is N, there shall be N+1 colours in the Color node. If the color field is NULL and there is a Material defined for the Appearance affecting this IndexedLineSet, the emissiveColor of the Material shall be used to draw the lines. Details on lighting equations as they affect IndexedLineSet nodes are described in 17 Lighting component. An IndexedTriangleFanSet represents a 3D shape composed of triangles that form a fan shape around the first vertex declared in each fan as depicted in Figure 11.1. IndexedTriangleFanSet uses the indices in its index field to specify the triangle fans by connecting vertices from the coord field. An index of "-1" indicates that the current fan has ended and the next one begins. The last fan may be (but does not have to be) followed by a "-1".Each fan shall have at least three non-coincident vertices. If normalPerVertex is TRUE, the normal for each vertex shall be the average of the normals for all triangles sharing that vertex. If normalPerVertex is FALSE, the normal shall be generated for the current triangle based on the ccw field. The solid field determines whether the IndexedTriangleFanSet is visible when viewed from the inside. 11.2.3 Common geometry fields provides a complete description of the solid field. The IndexedTriangleSet node represents a 3D shape composed of a collection of individual triangles as depicted in Figure 11.2. IndexedTriangleSet uses the indices in its index field to specify the vertices of each triangle from the coord field. Each triangle is formed from a set of three vertices of the Coordinate node identified by three consecutive indices from the index field. If the index field does not contain a multiple of three coordinate values, the remaining vertices shall be ignored. If normalPerVertex is TRUE, the normal at each vertex shall be the average of the normals for all triangles that share that vertex. If normalPerVertex is FALSE, the normal at each vertex shall be perpendicular to the face for that triangle. The solid field determines whether the IndexedTriangleSet is visible when viewed from the backside. 11.2.3 Common geometry fields provides a complete description of the solid field. 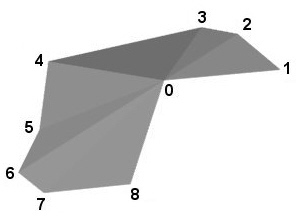 An IndexedTriangleStripSet represents a 3D shape composed of strips of triangles as depicted in Figure 11.3. IndexedTriangleStripSet uses the indices in its index field to specify the triangle strips by connecting vertices from the coord field. An index of "−1" indicates that the current strip has ended and the next one begins. The last strip may be (but does not have to be) followed by a "−1". Each strip shall have at least three non-coincident vertices. If normalPerVertex is TRUE, the normal shall be the average of all triangles sharing that vertex. If normalPerVertex is FALSE, the normal shall be generated for the triangle based on the ccw field. The solid field determines whether the IndexedTriangleStripSet is visible when viewed from the inside. 11.2.3 Common geometry fields provides a complete description of the solid field. The LineSet node represents a 3D geometry formed by constructing polylines from 3D vertices specified in the coord field. The vertexCount field describes how many vertices are to be used in each polyline from the coordinate field. Coordinates are assigned to each line by taking vertexCount[n] vertices from the coordinate field. Each value of the vertexCount array shall be greater than or equal to two. It shall be an error to have a value less than two. Lines are not lit, are not texture-mapped, and do not participate in collision detection. The width and style of lines are determined by the line properties specified in an associated Appearance node. If no line properties are specified, the default values for the fields of the LineProperties node shall be used (see 12.4.3 LineProperties). This node defines a set of 3D surface normal vectors to be used in the vector field of some geometry nodes (EXAMPLE IndexedFaceSet and ElevationGrid). This node contains one multiple-valued field that contains the normal vectors. Normals shall be of unit length. The PointSet node specifies a set of 3D points, in the local coordinate system, with associated colours at each point. The coord field specifies a Coordinate node (or instance of a Coordinate node). The results are undefined if the coord field specifies any other type of node. PointSet uses the coordinates in order. If the coord field is NULL, the point set is considered empty. PointSet nodes are not lit, not texture-mapped, nor do they participate in collision detection. The size of each point is implementation-dependent. If the color field is not NULL, it shall specify a node derived from X3DColorNode that contains at least the number of points contained in the coord node. The results are undefined if the color field specifies any other type of node. Colours shall be applied to each point in order. 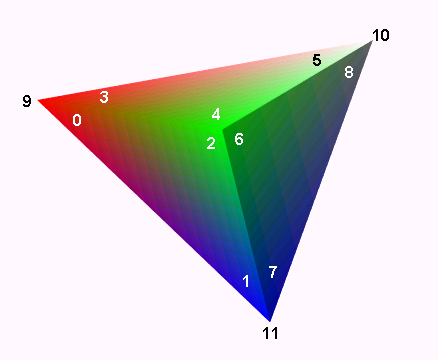 The results are undefined if the number of values in the X3DColorNode node is less than the number of values specified in the Coordinate node. If the color field is NULL and there is a Material node defined for the Appearance node affecting this PointSet node, the emissiveColor of the Material node shall be used to draw the points. More details on lighting equations can be found 17 Lighting component. A TriangleFanSet represents a 3D shape composed of triangles that form a fan shape around the first vertex declared in each fan. The fanCount field describes how many vertices are to be used in each fan from the coordinate field. Coordinates are assigned to each strip by taking fanCount[n] vertices from the coordinate field. Each value of the fanCount array shall be greater than or equal to three. It shall be an error to have a value less than three. Figure 11.2 displays a TriangleFanSet containing a single fan showing the ordering of the vertices for that fan. The TriangleFanSet node is specified in the local coordinate system and is affected by the transformations of its ancestors. Descriptions of the color, coord, normal, and texCoord fields are provided in the Color/ColorRGBA, Coordinate, Normal, and TextureCoordinate nodes, respectively. If values are provided for the color, normal, and texCoord fields, there shall be at least as many values as are present in the coord field. The value of the colorPerVertex field is ignored and always treated as TRUE. If the normal field is not provided, for each fan, the normal shall be generated as follows: if normalPerVertex is TRUE, the normal shall be the average of all triangles within that fan sharing that vertex. For the vertex of the fan, the normal shall be the average of the contributions of all of the individual face normals. If normalPerVertex is FALSE, the normal shall be generated for the current triangle based on the ccw field. The solid field determines whether the TriangleFanSet is visible when viewed from the inside. 11.2.3 Common geometry fields provides a complete description of the solid field. The TriangleSet node represents a 3D shape that represents a collection of individual triangles. The coord field contains a Coordinate node that defines the 3D vertices that define the triangle. Each triangle is formed from a consecutive set of three vertices of the Coordinate node. If the Coordinate node does not contain a multiple of three coordinate values, the remaining vertices shall be ignored. Figure 11.3 depicts a TriangleSet node with several triangles. The ordering of the vertices is also shown. The TriangleSet node is specified in the local coordinate system and is affected by the transformations of its ancestors. Descriptions of the color, coord, normal, and texCoord fields are provided in the Color/ColorRGBA, Coordinate, Normal, and TextureCoordinate nodes, respectively. If values are provided for the color, normal, and texCoord fields, there shall be at least as many values as are present in the coord field. The value of the colorPerVertex field is ignored and always treated as TRUE. If the normal field is not supplied, the normal shall be generated as perpendicular to the face for either version of normalPerVertex. The solid field determines whether the TriangleSet is visible when viewed from the backside. 11.2.3 Common geometry fields provides a complete description of the solid field. A TriangleStripSet represents a 3D shape composed of strips of triangles. 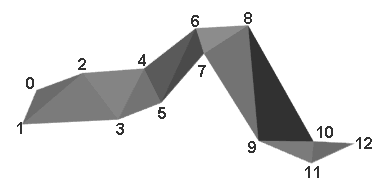 The stripCount field describes how many vertices are to be used in each strip from the coordinate field. Coordinates are assigned to each strip by taking stripCount[i] vertices from the coordinate field, where i is a sequential index of stripCount. Each value of the stripCount array shall be greater than or equal to three. It shall be an error to have a value less than three. Figure 11.4 depicts a TriangleStripSet with a single triangle strip. The TriangleStripSet node is specified in the local coordinate system and is affected by the transformations of its ancestors. Descriptions of the color, coord, normal, and texCoord fields are provided in the Color/ColorRGBA, Coordinate, Normal, and TextureCoordinate nodes, respectively. If values are provided for the color, normal, and texCoord fields, there shall be at least as many values as are present in the coord field. The value of the colorPerVertex field is ignored and always treated as TRUE. If the normal field is not provided, for each strip, the normal shall be generated as follows: if normalPerVertex is TRUE, the normal shall be the average of all triangles within that strip sharing that vertex. If normalPerVertex is FALSE, the normal shall be generated for the triangle based on the ccw field. The solid field determines whether the TriangleStripSet is visible when viewed from the inside. 11.2.3 Common geometry fields provides a complete description of the solid field. The Rendering component provides three levels of support as specified in Table 11.2. Color All fields fully supported. ColorRGBA Alpha value optionally supported. Coordinate All fields fully supported. IndexedLineSet set_colorIndex optionally supported. set_coordIndex optionally supported. LineSet All fields fully supported. PointSet All fields fully supported. All Level 1 Rendering nodes All fields as supported in Level 1. Normal All fields fully supported. All Level 2 Rendering nodes All fields fully supported except for ColorRGBA supported as in Level 2. IndexedTriangleFanSet All fields fully supported. IndexedTriangleSet All fields fully supported. IndexedTriangleStripSet All fields fully supported. TriangleFanSet All fields fully supported. TriangleSet All fields fully supported. TriangleStripSet All fields fully supported. All Level 3 Rendering nodes All fields as supported in Level 3. ColorRGBA Alpha value fully supported. All Level 4 Rendering nodes All fields as supported in Level 4. ClipPlane All fields fully supported.